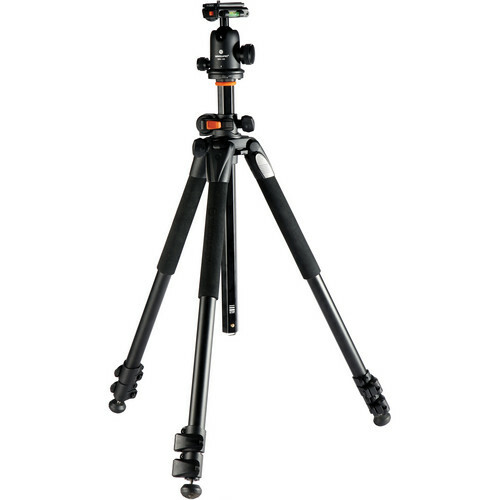 This Alta Pro 263AB 100 Aluminum-Alloy Tripod Kit from Vanguard supports up to 15.4 lb, measures 28.1" when folded, and includes an SBH-100 ball head with QS-39 Quick Release Plate. Each of its 3-section legs features an independent spread as well as flip locks for fast deployment. Together, the three legs can be can be positioned for a minimum height of 56" to a maximum height of 68.1" with the center column fully raised. Foam covers on each of the legs provide a secure, comfortable grip while moving the tripod, and rubber feet each with a twist-out, metal spike further enhance stability on a wide variety of surfaces, including soft and uneven soil. Cameras or accessories that are compatible with a 1/4"-20 mount can be connected to the QS-39 Quick Release Plate. The quick release plate can be attached or removed from the integrated clamp located at the top of the head's ball-and-socket joint by tightening or loosening the clamp's knurled, locking knob. The quick release plate features a rubberized, non-slip platform while two built-in bubble levels are located along the edges of the clamp. By loosening the ball head's primary locking knob, the head's ball-and-socket joint can be quickly swiveled, angled, fully tilted, or returned to its upright position. Toward the side of the ball head opposite the primary locking knob is a secondary locking knob, which controls the ability to rotate the head 360°. 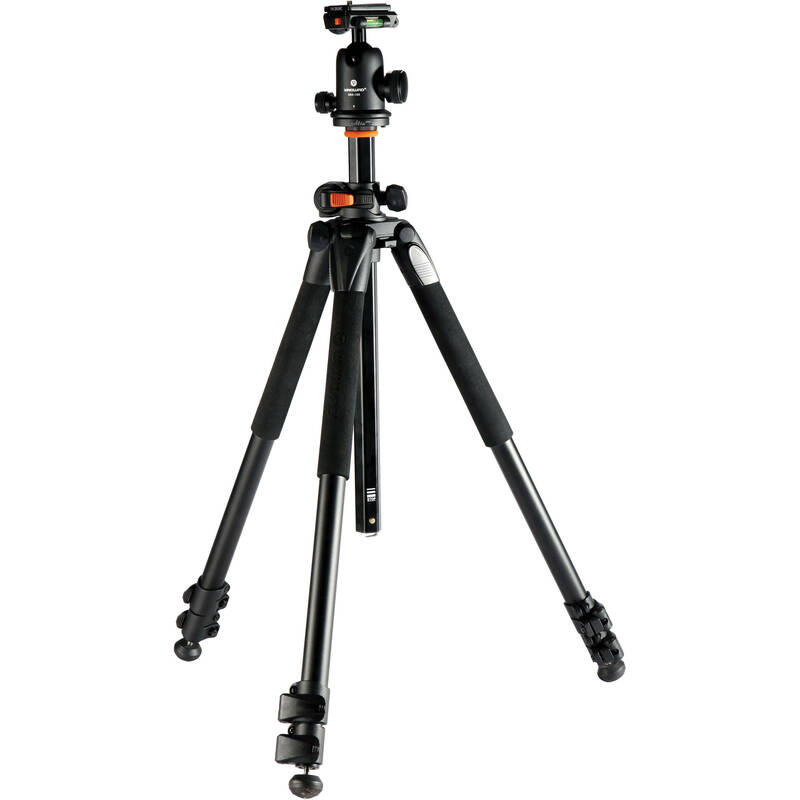 For added versatility, the center column is connected to the tripod by a fulcrum which enables 90° of upwards or downwards tilt that can be locked into place. Additionally, the center column assembly permits 360° of independent rotation. With the ability to push and pull the center column, those tilt and swivel movements allow the center column to be used as an extendable cross arm or a miniature camera boom. This allows an attached camera to be easily raised toward an elevated subject or over a scene. A camera that is placed toward the end of center column can be positioned perpendicular to the tripod, and extended past the tripod's legs, which is particularly useful for copy stand or macro photography. For subjects along the ground, the center column can also be used to obtain low angles while the tripod's user is positioned comfortably behind the camera. A carry bag is included for storage or transport. Box Dimensions (LxWxH) 29.5 x 5.2 x 4.2"
Alta Pro 263AB 100 Aluminum-Alloy Tripod Kit with SBH-100 Ball Head is rated 4.6 out of 5 by 253. Rated 1 out of 5 by Tony from NS from Misleading name Pro? No. After one week of use the legs won't stay extended, it takes almost no weight or pressure for one of the legs to compress when locked. The ball head is nice, but these legs are garbage. I'm using it with a T2i and Canon 100mm Macro 2.8L and it can't support the weight. I tried tightening the locks but the screws/bolts are already as tight as possible, I'd only strip the screws. I've been using gaffers tape to secure the legs, but this is time consuming and I've missed several photo op's while trying to put the tape in place, talk about frustrating. If you want a good tripod don't bother with this, spend a little more and spring on something italian. Rated 3 out of 5 by Anonymous from Built solid, but not Arca-Swiss compatible. I bought this product, as it was recommended by several websites I visit. This was my first tripod valued at over 50 bucks, so was pretty excited to get it. Unfortunately, it is not Arca-Swiss compatible. I was not aware of this when I purchased it. Completely my fault for not doing my DD on it prior to purchase. This reason alone was the reason I sent it back. Other than this issue, it seemed like a very solidly built tri-pod, and was easy to set up and get the hang of. Unfortunate about the Arca-Swiss incompatibility. Seems it wouldn't be too hard to do this. I would though recommend this tri-pod of Arca-Swiss compatibility is not an issue. Rated 5 out of 5 by Anonymous from Well worth it! I was hesitant to go with the Vanguard brand at first basd on my lack of knowledge of the brand. After extensive research I discovered that the quality and the amount of features were all on or above par of the more popular brands, but at a fraction of the cost. The tripod is very solid and yet light. There are plastic components on it, but they feel solid and robust. The head is great and provides a lot of grip while functioning like it's lubed with butter. Super smooth solid gliding action! I would definitely recomend this to anyone looking for a great quality tripod without breaking the bank. Rated 5 out of 5 by Photosnap Jon from Quality product with solid construction With so many to choose from... I purchased this tripod because its overall design features, quality construction and moderate price. As a photo enthusiast I wanted an all around tripod with as many features and functions that I can place my peace of mind in using medium weight equipment (T2i w/ 24-70mm f2.8 and 70-200mm f2.8 lens). Its well suited for the studio or even toting around on a backpack, although its not the lightest pod available. With its reversible-tilt-center pole, it has great potential for those extreme or low angle shots which I look forward to using soon, but it was its solid SBH-100 Ballhead that sold me. The tripod comes with an second mounting plate which really helps if you need to flip two cameras quickly, a quality carry bag and a rock/weight pad to attached between the pods extended legs. Rated 5 out of 5 by Mr. Meek from Very happy!!! Being fairly new to photograph with no plans on turning back, I did a good share of research. While looking for the best do all/bang for your buck tripod, this seemed to keep coming up on top allot. Love many things about this. The foam on the legs for grip and colder temps a plus. Where you mount the camera being able to come out and put the lens right to the ground. The multiple positions/angles to put each leg so you can place it in spots where the standard type tripod would not fit. The weight hook, if more stability is needed and retractable spikes on the feet. This is said to be one that hit the line of inexpensive and quality. I'm very pleased and would recommend. Rated 4 out of 5 by Anonymous from great tripod for the price Photo-enthusiast, semi-pro wanna be. Overall I am giving this about 4 1/2- 4 3/4 stars, it has it's drawbacks, but the performance makes up for it in the asking price. I am always looking to step my camera skills up to the next level and felt the urge to purchase a new tripod because the one I had been using for years would not squat low enough for macro shots. This one does that and I very pleased with it so far. For convenience I was looking for one that I could strap to my back pack - that criteria was a fail on my part because I underestimated the actual size (no fault of the vendor, they gave the size specs). The size fail was easily forgiven because it has its own carrying case with a strap. In addition the size was overlooked because I was unwilling to compromise on the max load capacity. The lighter/smaller tripods couldn't meet the 12-15 lb max load I wanted -- I was looking at possible future purchases of heavier full-frame cameras and heavier zoom lenses. At this point I've only used the tripod twice; once for a night cityscape shoot and another for a macro shot of a spider web (photo of tripod in action attached) and I am more than happy with it. I'm new to both the ball head and the ISSL features. The multiple levels are very handy too. Really loving the ISSL for macro shots. I think the ISSL will prove itself as well for the radical angle shots I am fond of (when using a wider lens). The legs are a bit sticky as mentioned in a previous review, but that didn't warrant for a poor rating from me. Neither was the lack of understandable directions a big deal for me because I am more of a hands-on learner. I am very VERY pleased with my purchase and would definitely recommend this tripod to someone who wasn't willing to spend a lot of money for a professional grade tripod. Attached is an image to show what the tripod and ISSL is capable of. Please pardon my amateur snapshot, as it was taken with my phone and intended to show off the the tripod itself. Also please note that I wasn't worried about the tripod tipping because the one foot was jammed up against a solid wall - wouldn't recommend this set-up out in the open unless the weight sack is hanging between the legs of the tripod. Thanks for the read. Rated 5 out of 5 by Anonymous from Great Tripod I was looking for a great tripod at a reasonable price and I found it in Vanguard's Alta Pro 263AB with the SBH 100 Ballhead. I had looked at tripods at my local camera store but they started in the $200 price range and the ballhead was extra. So the combo from B & H was a super deal. It has all the functionality that I need and then some. It is easy to use and setup, it also came with an extra mounting plate which is great if you need to switch out different cameras quickly. I really like the ballhead locking mechanism as it holds the camera securely, it is also easy to use. There are also multiple bubble levels to help when leveling the tripod. Rated 5 out of 5 by pakarate from Super Tripod and With Ballhead I got this primarily for outdoor use for nature/wildlife photography. It is an excellent tripod, not to heavy and at an affordable price. Quick setup, sturdy locking mechanism and I love the ballhead. It also extends tall enough for me to be comfortable for a day of shooting ( i am 6'1). The Vanguard Alta Pro is capable of holding large lenses, macro angles, and good flow with the ballhead. Cons - the only one is that I would like a quick head release so I could in the future quickly switch from the ballhead, but not an issue in my mind. Pros - Sturdy, light weight, easy to use, tool kit, excellent ballhead, bag, quick setup, durabliity. Is the quick release plate compatible with an arca tripod plate? The QS-39 is a proprietary Vanguard quick release and will not be compatible with Arca Swiss. Hi, Is there an international warranty with this product? If not, is one available with some extra fee? Thanks! Is this the same tripod as the Vanguard Alta Pro 263 AT, just with the added ball head? I know that this Model comes with a Ballhead, and My question is that is it Universal? I have a Canon 60D, and I wanted to know if it's compatible? The SBH-100 ball head included with this Vanguard tripod would fit on the bottom of your Canon EOS 60D via the quick release plate for the head. How tall is this tripod with out the middle extension extended and camera on. The tripod is 56 without the center column extended and the legs adjusted to max height. can I change the ballhead and if yes how ? Yes, you can change the ball head on the Vanguard Alta Pro 263AB 100 Tripod. You simply unscrew the head from the legs. Is it change to Sunwayfoto DDC-60i Screw-Knob Clamp (60mm) ? It is our opinion that changing the Vanguard top plate is probably not possible. I'll be using a Canon 7D. Is the ballhead that is included compatible with this? Yes, the ballhead is fully compatible with the 7D.